The main menu of my january game. 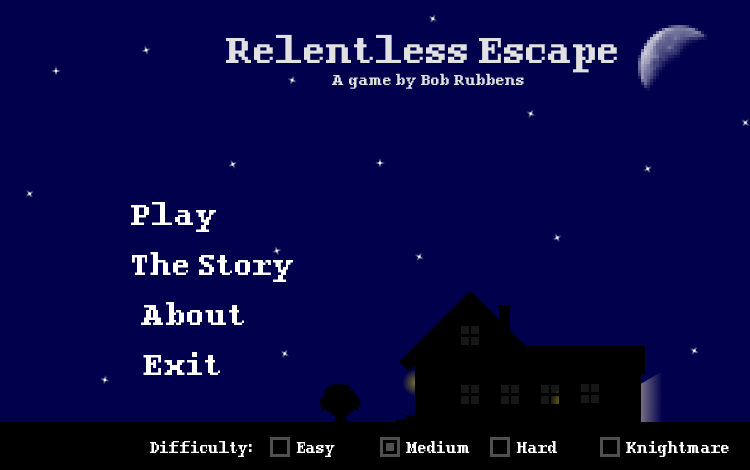 For the january game of the One Game A Month 2013 challenge I’ve made a Relentless Logic clone: Relentless Escape. Relentless Logic is an old DOS game. A good way to describe it would be as a first person minesweeper game. When I found out about that game I really liked it, but I couldn’t find a neat updated version of it. And so, my first january game was decided. You can download it here: https://dl.dropbox.com/u/65227065/Relentless%20Escape.zip . If you happen to find any bugs, please let me know. I did my best to find them all but there are probably still some I have missed. Also, if you’re interested in the source, here’s the link to the repo: https://github.com/bobismijnnaam/rescape . I haven’t extensively commented it though, but if someone would like that I can still do that.